Dropping in to share a bit of sunshine to hopefully brighten your day! See you back here soon! A new challenge starts tomorrow, and I’ll share all of the details. 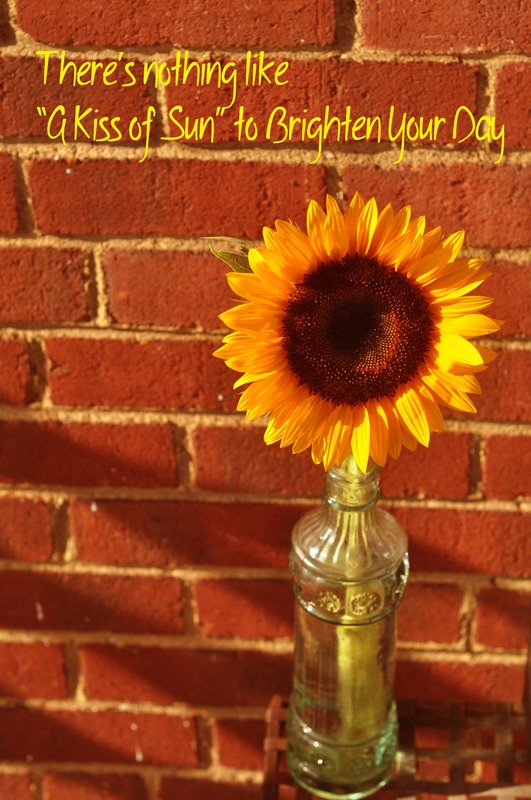 Adding a little sunshine to the day! The previous post is supposed to have incorporated a “mouse over” meaning that when you hover your mouse over the image you will see the before processing and then the after processing version. I actually saw this work! Right here in my little composition window, but the moment I saved it and sent it on it’s merry way everything when phlatt! (yes I know that’s not a word) but I hope you get the gist! I’m bummed… but this is what I felt about thirty minutes ago! Keep your eyes on this space because I am determined to have success! I’m pleased as punch! I was able to successfully complete my first “mouseover” a technique that will show the ‘before’ and ‘after’ of a shot! In case you can’t hear it in my words, I am definitely doing the “HAPPY DANCE”!!! Little triumphs like this just make my day! They also help me to justify the expense of taking these online courses. My “Plan B” in life is to develop an enterprise that utilizes my passion for creating with words and photos into something that will help support me, I’m not there yet so at times I will question the expense. Again doing the “Happy Dance” and singing Yay!!!! Because justified or not this “Behind the Scenes” course has really been a great experience. Not only has it given me a lot of insight into things that I can do to improve upon my online experience it has also armed me with so many ideas and a whole new community of bloggers! Today has been so “Beyond Awesome”! I hope you enjoy my “mouse over” and that you will take a moment and peek at some of my other work. As always comments are welcome – they help us to grow! Author shelleyshockleyPosted on July 20, 2012 July 20, 2012 Categories Behind the Scenes, Joy, PainLeave a comment on Short Lived Euphoria! Behind the Scenes “Mouse Over” Success ~ Yay!!! 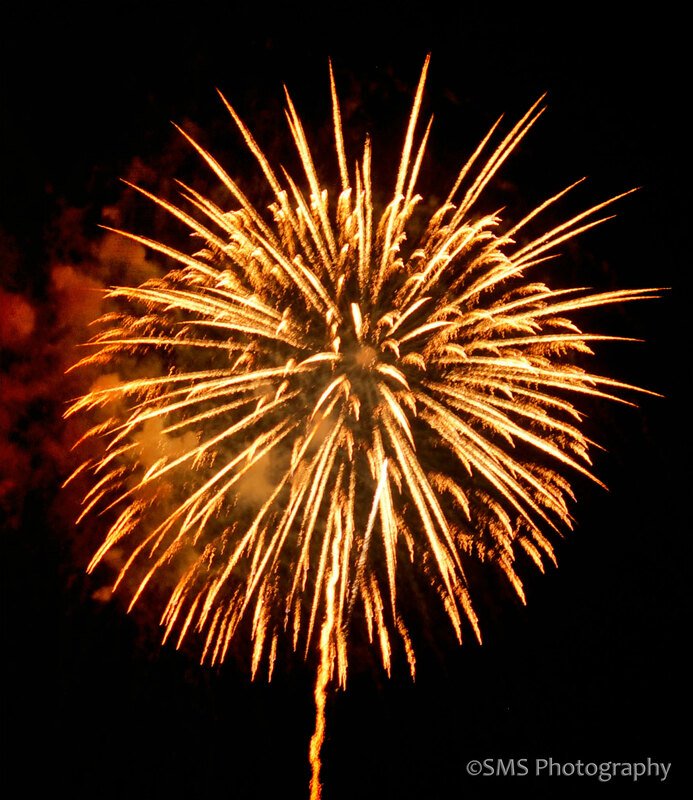 Author shelleyshockleyPosted on July 20, 2012 Categories Behind the Scenes, Kim Klassen, SheepLeave a comment on Behind the Scenes “Mouse Over” Success ~ Yay!!! Sheep graze along the Shoreway in Cleveland compliments of the St. Clair Superior Community Development Corporation. One of the things I love about Cleveland is you just never know what you will see on any given day. For weeks I have been trying to spot the sheep I heard were grazing along the shoreway to no avail, and then last week a friend mentioned seeing them as well as a sign explaining their presence. Passing by this area daily I continually forgot to look until this evening as I made my way home I detoured slightly to try and get a peek. On the first drive by I didn’t see them, but after turning around to go home I looked a little further into the field and eureka! The photo pictured above has been treated with Kim Klassen’s “dream-field” process from her Beyond Layers course. The end result is a dreamy, hazy look at sheep grazing in Cleveland! Enjoy! As always your comments are welcome. This marks the final week of Behind the Scenes, the online course I have consistently referred to as Reflection of You! Isn’t that a hoot, I’m so behind in this class that I didn’t know until yesterday that I had been calling it the wrong name. 1. What makes you happy?….. in 5 words or less….? Family, creating, memories and assisting others. The ability to organize my life so that there is really time for things that I am most passionate about. Hope that makes sense, but I need organization in my life in a BIG way! 3. Which words or phrases do you overuse most? I’m not sure about this, but I know for the last several weeks I have probably overused “It’s too dang hot” and I probably utter “Lord give me strength” on a daily basis several times throughout the day. 4. What is your favorite movie, book or both? This is sooo hard! So I’m going to cheat a little my favorite chick flick is “love jones” my favorite suspense movie is “Rear Window” and my favorite book is “Orange Mint & Honey”. 5. If you could go anywhere in the world for a creative retreat where might it be? My first thought was Jamaica or some other island location because I would love to be near the water and while visiting Jamaica there were a number of resorts that would make heavenly creative retreats. If I’m unable to do an island retreat I would like to be near water in a secluded area – probably on the east coast of the United States. That’s a little about me, what about you? What are your responses to the questions? I would love to hear from you! A Sports Weekend in CLE! What a busy weekend! 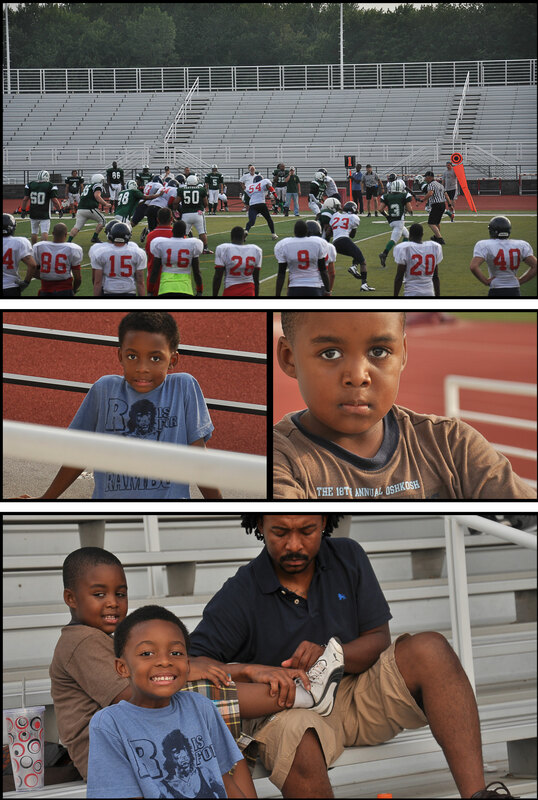 First I experienced that Aha moment with this site, but then I had to drop everything and run out and support my niece and nephew as they each exhibited their athleticism in baseball and football. After shooting both games I decided to try out Day 10’s assignment from Reflection of You. The layouts below are my attempt. 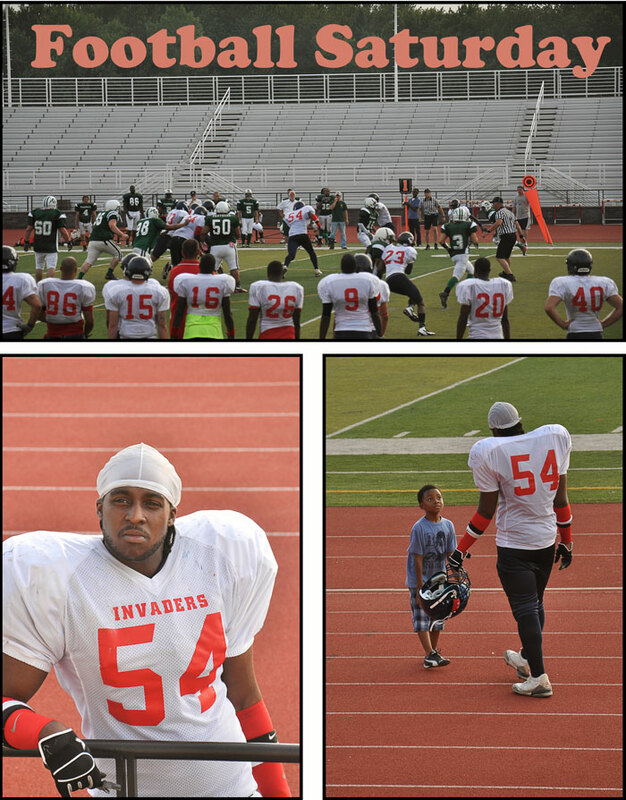 Semi-Pro Football game featuring our own star – Adrian Hampton, middle linebacker for the Invaders. 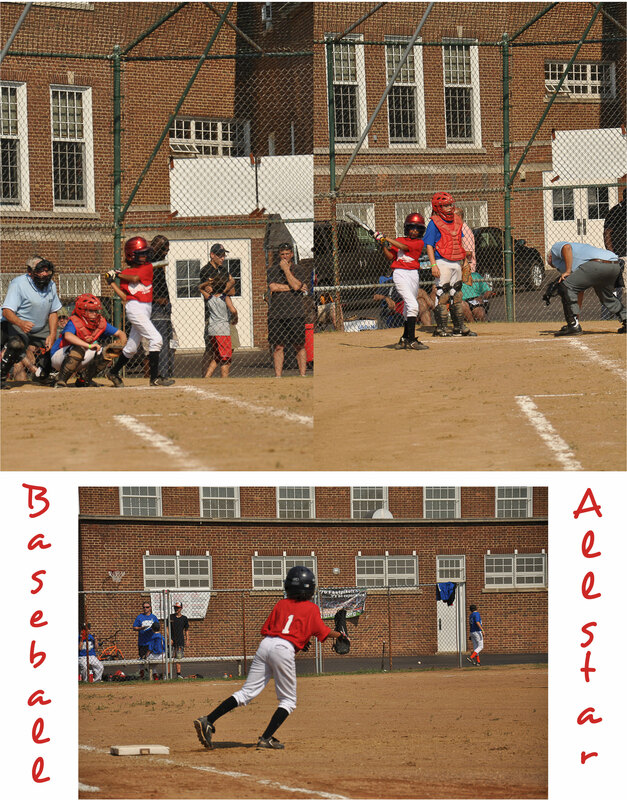 Author shelleyshockleyPosted on July 16, 2012 Categories Family, Reflection of YouLeave a comment on A Sports Weekend in CLE! Welcome to my new site! I’m a little apprehensive, yet thrilled with this change. For over a year now I’ve been a little unhappy with my previous format for a number of mostly aesthetic reasons. I really wanted my photos to pop off the page and while I’m sure I could probably have achieved the same goal with my former site, I was finding it very difficult to determine just how to do it. The biggest hurdle though was adding pages. I have found that other bloggers solved that dilemma using custom layouts, but once again I was at a loss. I can’t say this format was a cakewalk in that it really has taken me about a week to get things the way I wanted them and I’m still not totally satisfied. I’m posting today because it’s time – if I keep trying to tweak the site without adding content I’m defeating my purpose and languishing in a state of procrastination. So take a look around and let me know what you think. There are still kinks to work out, but I think this is a good start. Before closing I must thank Kim Klassen and Xanthe Berkeley for creating Reflections of You, an online course on blogging that has given me a greater sense of purpose for this space and great tips on how to create a more inviting site. Again, welcome and please come again!